By now you’re surely aware that the Internet is a popular way to listen to radio—terrestrial and, of course, Internet-based. You may also be aware that in addition to being able to listen to these audio streams from a Web page and within iTunes’ Radio entry, there are applications designed for listening to and recording them. GagaFactory’s recently released Radio Gaga is just such an application. I’ve used the program for a little over a week and these are my first impressions. This may be the nicest looking Internet radio application I’ve used. 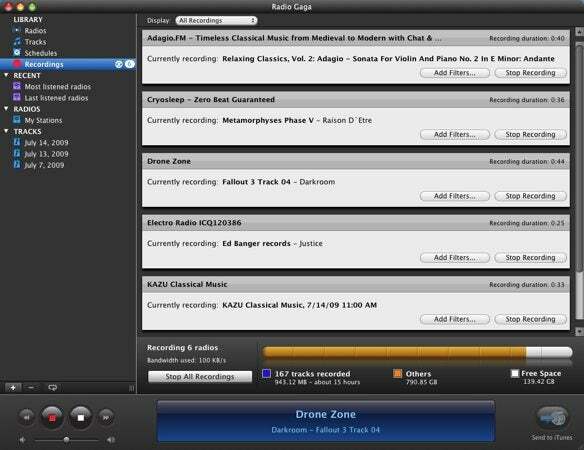 Bearing a dark gray interface similar to Apple’s pro applications, Radio Gaga presents content in an iTunes-like view. Along the left side of the window is a pane similar to iTunes’ Source list. Within this pane you find Radios (stations), Tracks (tracks you’ve recorded), and Schedules (schedules you’ve created to automatically record streams at times of your choosing). Additionally you find Recent, Radios, and Tracks headings below. Recent displays the stations you’ve listened to the most often as well as stations you’ve last listened to. Radios is an area for storing stations you’ve added. And Tracks breaks down recorded tracks by the date they were recorded—July 14, 2009, for example. Select Radios and you see large shiny badges that represent genres—50s, Alternative, Disco, Latin, Reggae, and Talk/Spoken among them. Beneath each badge is the number of stations available within that genre—Hip-Hop/Rap, for example, shows 230 radios. Radio Gaga claims it offers over 10,000 stations and says it will routinely update its stations database. If Radio Gaga doesn’t have a station you’re looking for and you have a compatible URL for it, you can add it yourself. To do that you must first find the station’s URL. You can do this by copying the Play Now link on many stations’ websites or going to iTunes, selecting one of its radio stations, pressing Command-I to bring up the Info window, and copying the URL from the Summary tab. Once you have the URL, return to Radio Gaga, choose File -> Add New Radio, paste the link into the URL field, and the station appears under the Radios heading in an Untitled Radio List entry (the name of which you’re welcome to change). To play a station just select it and click the Play button at the bottom of the window (or double-click the station). Within seconds the station plays. (Every so often you find a “dead” station that won’t play because the server’s off the air.) The name of the station, artist, and track (if that track and artist information is available) is displayed at the bottom of the Radio Gaga window. If you care to, you can then click the red Record button. Radio Gaga will record the stream until you tell it to stop, your hard disk fills up, or when your hard disk has a user-defined amount of free space remaining—10GB, for example. Radio Gaga’s recording capabilities are particularly nice. Unlike some other methods, it can record multiple streams simultaneously. This is a terrific way to quickly acquire a lot of audio. And if you select your stations carefully, you may even like what you wind up with. The quality of the recordings depends entirely on the quality of the streams you get. When selecting streams it’s wise to sort streams by their bit rate. The higher the bit rate, the better the quality is likely to be (and the larger the resulting recorded files). You can also create filters within your recordings. These filters look for tracks matching particular title or artist information. For example, if you’re recording a station that plays 60s music, you can ask it to record only tracks by The Beatles. Or use multiple Name conditions that include the words “Whiskey,” “Truck,” “Dog,” and “Cheat” for those times when you’re looking for done-me-wrong country music. Recording multiple streams with Radio Gaga. The Schedules feature is nicely presented. Just select a station and choose Advanced -> Record on Schedule. The main pane displays a Schedules entry where you can set a date, configure the record duration (60 minutes, for example), and configure a repeating schedule—every Monday, for instance. You can also configure Artist and Name filters from within a schedule. Radio Gaga does its best to identify and split the streams into individual tracks. These tracks appear under the Tracks heading. You can listen to a track by selecting it and clicking the Play button. You can also select one or more tracks and click a Send to iTunes button to transfer the tracks, in their native bit rate and MP3 format, to your iTunes library. Regrettably, this scheme isn’t perfect. Some stations I tested misuse the artist and track tags. Rather than presenting this information, they use these tags for a slogan or some other kind of text that changes every 30 seconds or so. Radio Gaga interprets this as a new song starting and so creates a new track (yes, I’m looking at you, La Radio de Sebb). It also isn’t precise about when tracks stop and start. The program appears to use a volume threshold as one of the techniques for determining when songs begin and end. If a song fades out and, in the process, falls below the threshold, the end of the songs is cut off. It’s also imprecise about when some tracks start, so you may lose the first couple of seconds. The program includes a Merge Tracks command that helps with this (a previous or succeeding track may have the missing audio) but it would be nice if there was an advanced mode where you could tweak the volume threshold settings in order to more carefully control the cut off points. I’m impressed with the presentation and potential. Iron out the imprecise splits (or, at least, give me some control over how they’re executed so I can take a stab at it) and Radio Gaga becomes an application I run early and often. 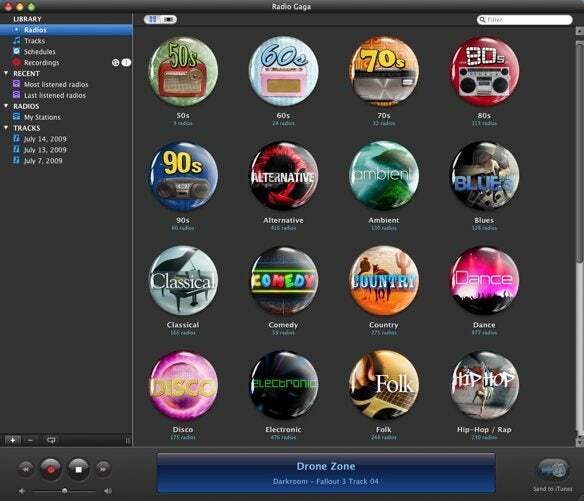 You can purchase Radio Gaga now through July 19th for $20 via a MacUpdate Promo launch. After the 19th the price will be $40.